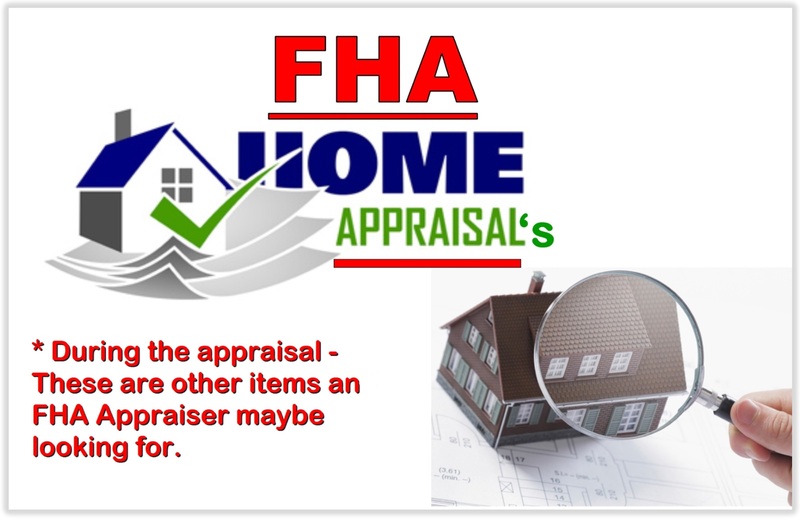 FHA Appraisals what else are FHA appraisers looking for? What else are FHA appraisers looking for? If you plan to use a Federal Housing Administration (FHA) loan to buy a house, the property will have to be appraised and inspected by a Housing & Urban Development (HUD) approved home appraiser. This individual will determine the current market value of the property, and will also inspect it to ensure it meets HUD's minimum property Health & Safety standards. An FHA’s certified appraiser’s home valuation is only one component of the individual’s assigned job to be completed. FHA appraisers also have an eye toward ensuring the new homeowners will be safe in their purchased home. Therefore aside from the appraisal, the appraiser is also required to utilize and apply the HUD inspection guidelines in regards to Health and Safety. Thus FHA appraiser’s need to report all deficiencies of a property's condition and whether or not any deficiency is a threat to the buyer’s Health and Safety including any deficiency that jeopardizes the homes structural integrity. FHA appraisers are not home inspectors, they do not look at the home from top to bottom, but they do what is commonly called a "general inspection" and in doing so they go through the house seeking obvious problems in order to make sure that the entire property is up to FHA insurance standards - otherwise the home may not be approved for FHA financing. Keep-in-mind that the FHA appraiser’s main focus is to determine the market value. This with a great emphasis on size of the home, size of property and recent sold “comparable” homes in the nearby area within the past six months. Their secondary concern is the condition of the house. Let’s take a quick look at what is the definition of an appraisal - An appraisal is an expert assessment of a particular product or asset (in this case a house) to determine the market value of the home that is contracted to be purchased. During this process the appraiser will look at comparable properties that have sold recently in the same area as the one being purchased. The appraiser will also visit and inspect the "subject house" and evaluate both the interior and exterior. After this review process, the appraiser will write a report to detail his findings. The report will be in two parts: (1) an estimated value of the home as well as (2) any required repairs deemed necessary in order to meet HUD’s minimum standards for Health and Safety. The report will then be sent to the mortgage lender for review and further action. Simply put, what makes the FHA appraisal process unique is the level of inspection that is required by HUD. If the HUD approved appraiser flags (ie: calls out) certain issues such as peeling paint, loose handrails, non-operational windows, broken windows, or other safety issues, then these issues must be corrected before the loan process can continue to move forward for it to be funded. In other words, the transaction will be put on "hold" by the mortgage lenders underwriter until the discrepancies are resolved. This inspection and flagging of any health and safety issues is not the case when a regular appraisal is used for a Conventional (non-government insured) type of home loan. HUD greatly encourages FHA home buyers that it would be wise to have a complete "regular" home inspection separate from the general "health-and-safety" inspection conducted by the FHA appraiser. All borrowers who use the FHA Home Loan program have to sign a disclosure that says something to the matter as… "I (buyer/s) understand the importance of getting an independent home inspection. I have thought about this before I signed the purchase contract with the seller of the home." As-you-know: Condo projects feature ownership of a portion of a property rather a buyer owning the entire property. Such ownership requires HOA agreements and covenants between the owners and the HOA which specifically state who is responsible for the care and upkeep of the owner units and its common areas. A key thing to remember is that condo ownership means you own 100% within the interior walls of your unit and a zero % of the common areas. As a rule the following also must be met to be considered for an FHA condo loan approval... In a "condo complex", at least 51% of the units must be owner occupied. No more than 10 percent of the units may be owned by one investor, entity and/or an individual. Of the monthly HOA fees collected, FHA requires that there be an established “Reserve Funding”. This stating that at least 10% of all budgeted income (from monthly HOA fees collected) must go toward the reserve account. There are multiple uses for a Reserve Account. Here is an example of some of the use and purposes... the reserve should be with sufficient funds to cover all condo complex insurance deductibles, any capital repairs, road maintenance and insurance coverage must be for 100% of “replacement cost” of the condominium structure/complex... this in case of an unforeseen catastrophe. There is more detail and/or requirements as to whether a condo complex is FHA approved. The rules can also vary slightly depending on the size and number of units in the complex, therefore always check with your mortgage lender for more information. FHA does not require the PUD complex to be on the official list of FHA (HUD) approved projects in order to qualify for FHA insured loan funding. PUD's are treated like single family homes (SFR's) therefore, just like SFR's there is no pre-condition for placing FHA mortgage insurance (ie: FHA insured loan funding). Although they look like condo’s, PUDs are "true townhomes". With a PUD you own a parcel/plat of land and the structure itself. It will have a common wall next to the unit that is your neighbor. Once in a while you will find “detached” units in a PUD development but for the most part, most all are attached with a common wall. The PUD "Parcel Identification Number" (PIN) resembles that of a detached Single Family Residence. The PUD lot and dimensions is clearly identified in the property plat map (same as SFR’s) whereas Condos are “grouped-in” with the entire property/lot of the condo complex. Know that if there are common areas, the association owns them. If obtaining an FHA or VA loan and if the unit you want to buy is a PUD, there should be no problem in obtaining a government insured loan in that regard. Simply remember that both FHA and VA treat PUD’s like single family homes and the complex does not need to be on the official list of the VA or FHA (HUD) approved residential complexes in order to qualify for the FHA or VA insured loan funding. 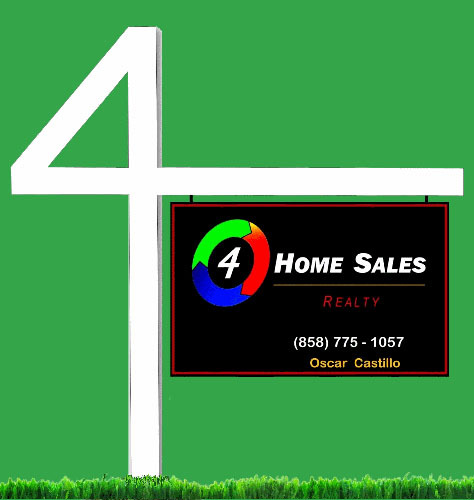 * NOTE: I Oscar Castillo am not a Home Appraiser nor am I in the Mortgage Home Loan business. I am a local San Diego County REALTOR® Broker, a Listing agent and Buyer agent. My intent for this FHA Appraisal information is for it to be useful and informative to you as to what else do FHA appraisers look for during the FHA home appraisal process. It is fully recommended that you communicate with your mortgage lender in regards to the full scope and responsibilities of the lender selected FHA or VA Appraiser...... If you are not working with a lender yet, let me know and if you wish I can to send you a few local mortgage lenders contact information. My experience tells me that you may have a question or two.... if by chance you do, always know that I will certainly make it a point to make myself available for you. I can answer your questions in a matter of minutes and it would be my pleasure to do so.